We have owned the garden across the road for about a year now and I am proud to say, so far we have lopped a load of massively overgrown Christmas trees down and destroyed masses of bushes of unknown origin. 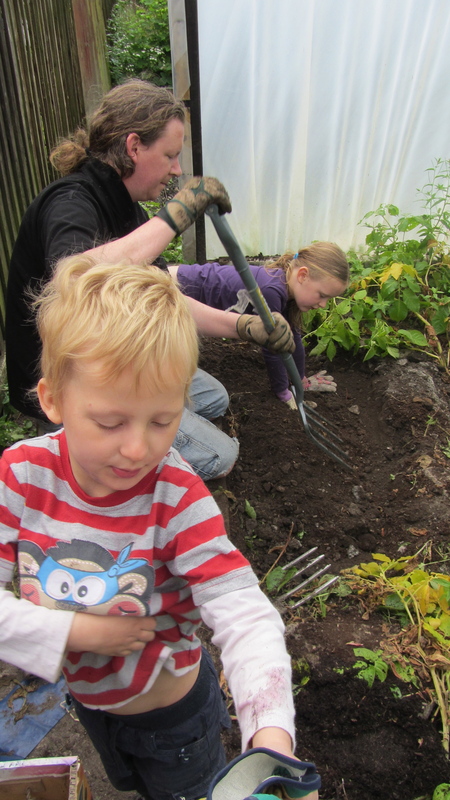 We are rocking the ‘Garden Thing!’ whatever that is. As you can see our garden is beautifully manicured, well maintained and not at all rainforest like. In addition to this, last year I had a load of peppers, cucumbers and other veggies in the polytunnel which Sweara (MIL) gave me. 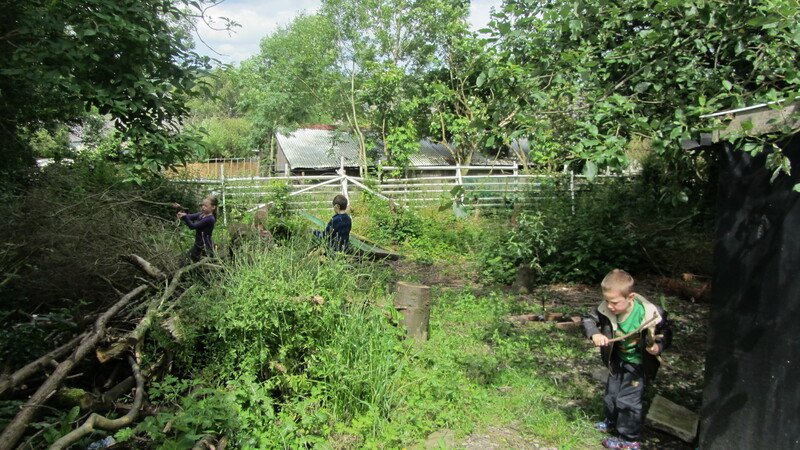 I would love to say that they grew really well and we had a fantastic harvest and I spent many hours slaving over a hot stove making home made veggie curries etc ….but I can’t, because I didn’t, I murdered the plants instead. In cold blood I’m afraid. I deprived them of human comfort and denied them water. I’m a plant killer. Bad me. Very bad me really. My initial burst of enthusiasm was dampened by drizzle and laziness. There I’ve admitted it. I promise to try harder. At least this year we’ve managed our first proper harvest! It’s erm…potatoes. Yes, I know! Potatoes grow themselves really, and it’s not hard and it’s nothing to be really proud of, but goddamit I am proud anyway! We grew something and now we get to eat it! In yer face ASDA! Sausage shouted ‘Potatoes-tatoes-tatoooes!’ hysterically quite a bit. 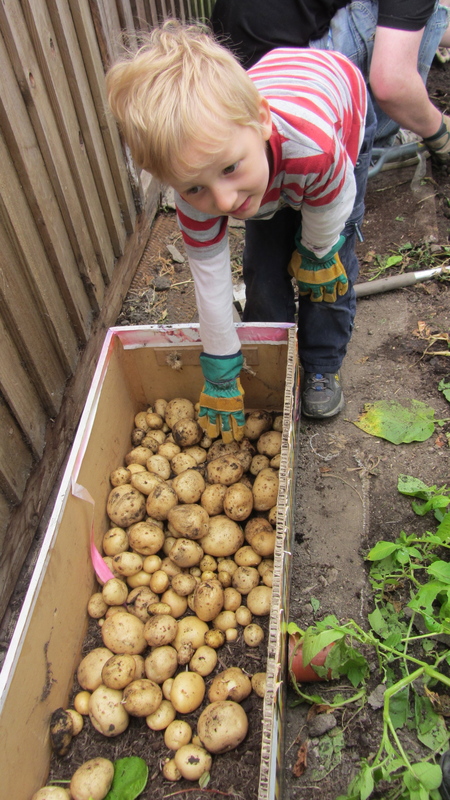 He was very excited and sulked if no-one passed him any to put in the spud box. I know a bag of spuds cost barely anything and the effort that goes into growing your own is hardly worth it really, but we get completely organic, home grown potatoes on our plates within hours of them coming out of the ground this way. How cool is that! I’ll admit finding finding potatoes with suspicious holes in and finding weird wiggly things in the spud box is a bit of a downer, but I’m willing to persevere with this regardless. 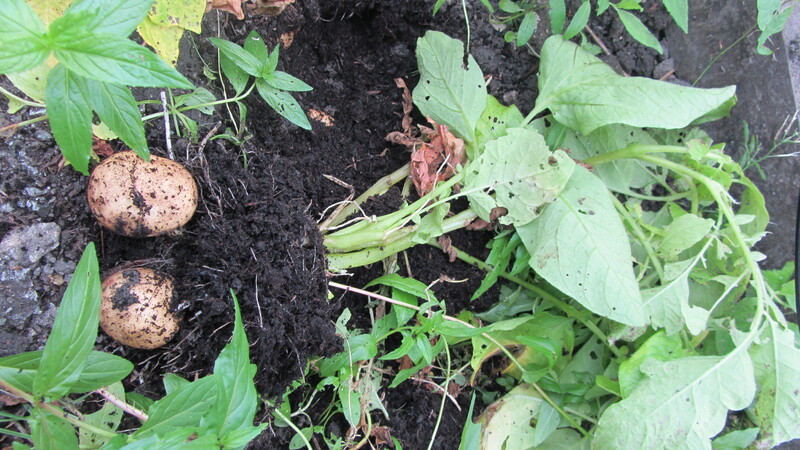 There’s something so rewarding about digging them out of the soil, I think it’s the remainder of the hunter / gatherer instinct. I get the same satisfaction from picking berries and collecting eggs. My parents used to keep hens until a fox massacred the lot of them one gory night. I do like foxes, but I don’t like it when they mix with livestock very much. I’ve toyed with the idea of chickens a lot recently, but I’m not sure if I could cope with Reservoir Foxes in my back yard if one of the blighters gets into the garden and has a feeding frenzy. Maybe we will have feathered friends, maybe we won’t. Apples of the earth! We have more Pomme de Terres than we know what to do with! So what’s for tea then? Mashed spuds with a side order of chips? Or maybe wedges with boiled potatoes for pudding? 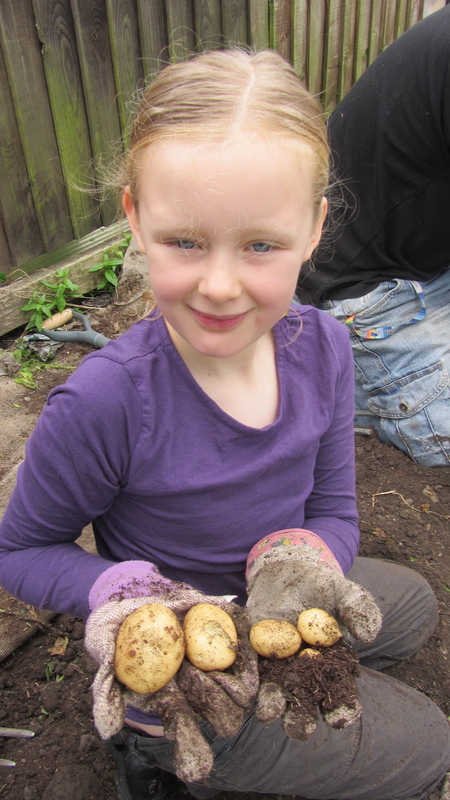 I do love that the kids got so excited about our very first harvest. Sausage and Darlek both know exactly where potatoes come from, they’ve planted them, watered them and dug them up too. From what I can gather they really enjoyed the experience and I do hope that they continue to be enthusiastic about where their food comes from and pay attention to how it’s grown a little from now on. If nothing else I’ll be happy if Sausage now knows potatoes don’t grow on trees and Darlek remembers that a single potato has the potential to grow and multiply itself many, many times. It really is quite amazing that one single lonesome spud has the potential to reproduce itself so many times. Nature is amazing, it’s easy to forget that sometimes I think. Treasure! We found the spout of a tea-pot which I thought looked very much like a tiny brown leg. 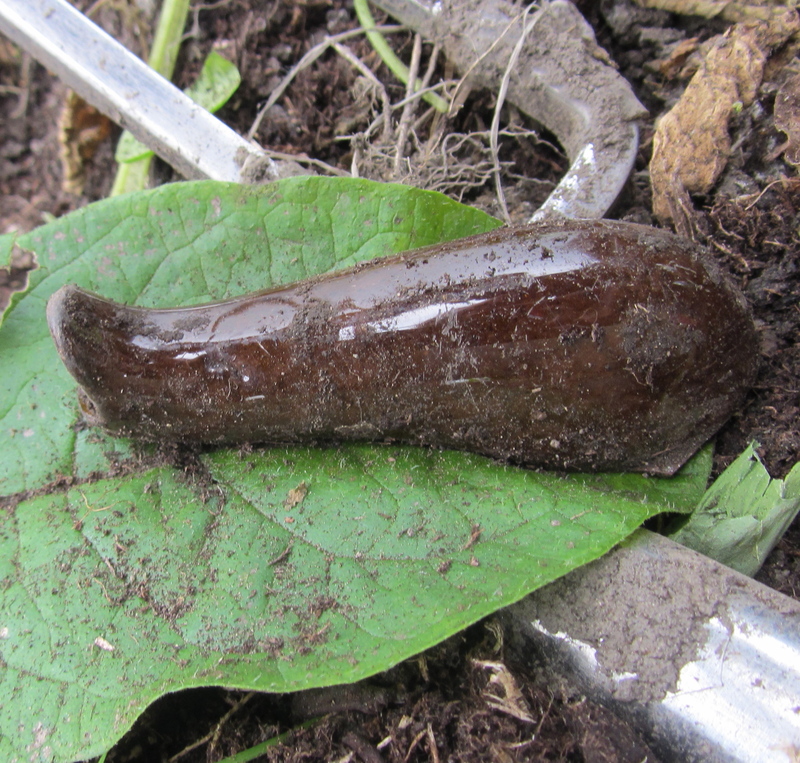 So it’s not a mahoosive slug, or a poo before you say as much. After a lot of digging and muttering about mucky fingernails, we took a bag of them indoors and I washed them in the sink. The colour of the water was disgusting, Sausage refused to put his hands in there although he did like plopping them in the water in the first place. 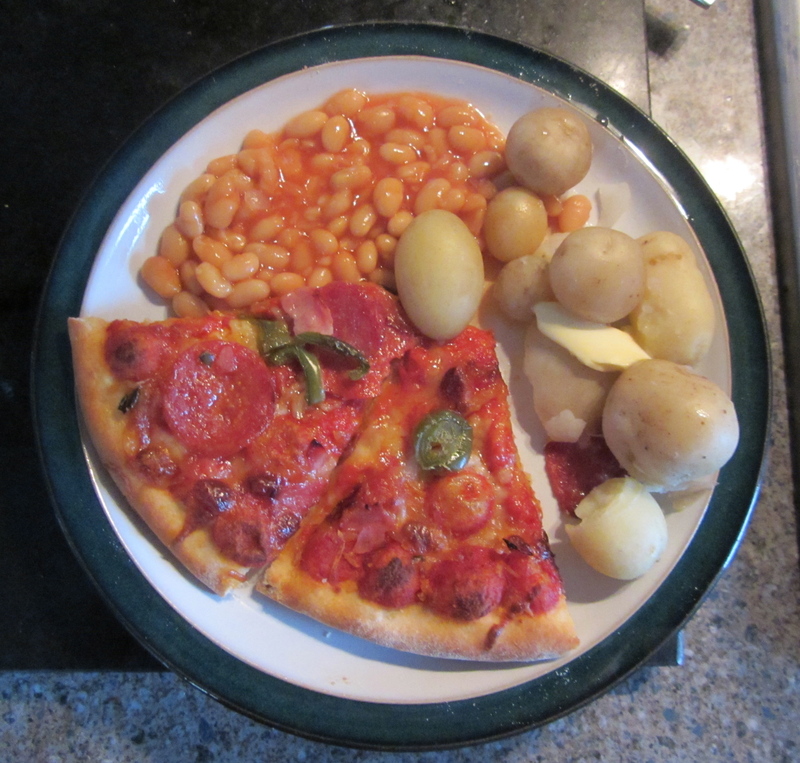 I decided to make boiled new potatoes to go with our erm…..supermarket bought pizza and beans out of a tin. Classy meal eh! Well, maybe not completely ‘In yer face ASDA!’, maybe just a quick ‘Ner-ner-ne-neer-ner!’ instead. Tiny spuds! Some were the size of marbles and were actually cute. I’ve never seen ‘cute’ potatoes before. Here’s the end result! 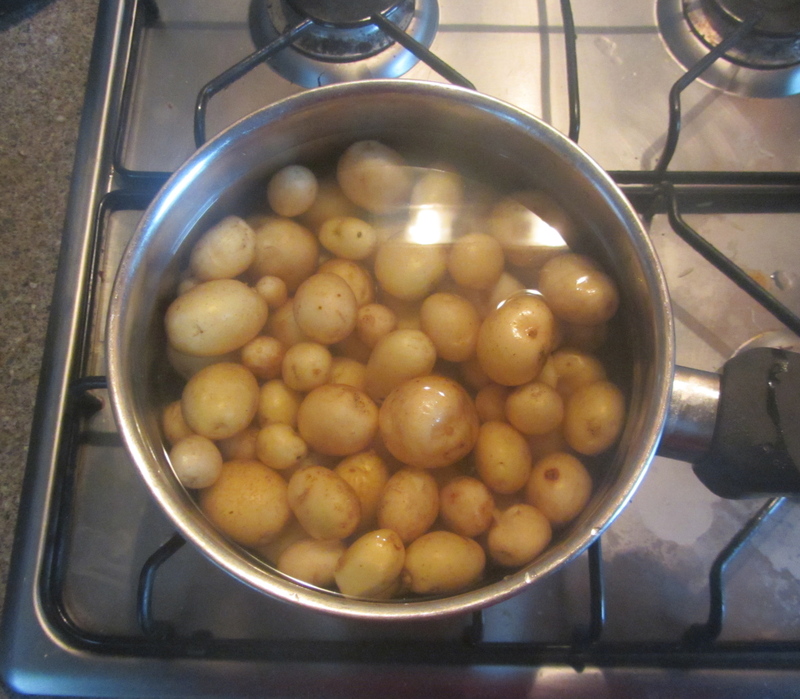 I know the meal itself wasn’t exactly nutritious and that Annabel Karmel would probably tut at it, but at least it included home grown, organic, freshly dug, cute potatoes! I think the potatoes cancelled out the trashiness of the rest of the meal, or at least that’s what I told myself anyway. So there you have it, our very first harvest. From garden to plate! I noticed the peas have grown too today, so we will be sitting in front of the TV snacking on crunchy pea-pods instead of popcorn very soon too. I’m sure the kids will be overjoyed. Maybe, maybe not. Most likely I’ll resort to bartering, ‘If you eat three of those pea-pods, you can have some Coca-Cola.’ Well it’s a start isn’t it!